We are a private business owned and founded by a degreed and published marine scientist with over 28 years of aquarium husbandry experience and several years working in the aquarium profession as lead researcher and advanced technical support specialist at a leading manufacturer of water care products. We implemented a M.A.P. program in 2007, less than 6-months after we began sales, and monitor this program as required. We strive every day to deliver the highest quality product at the fairest price. We do not sell to mega-retailers. We treat every retail account, no matter how large or small, with the same degree of respect and attention; there are no programs to single retailers out and force them to place excessively-large orders in order to maintain “preferred” status. We are committed to using the highest purity and quality ingredients available to us. 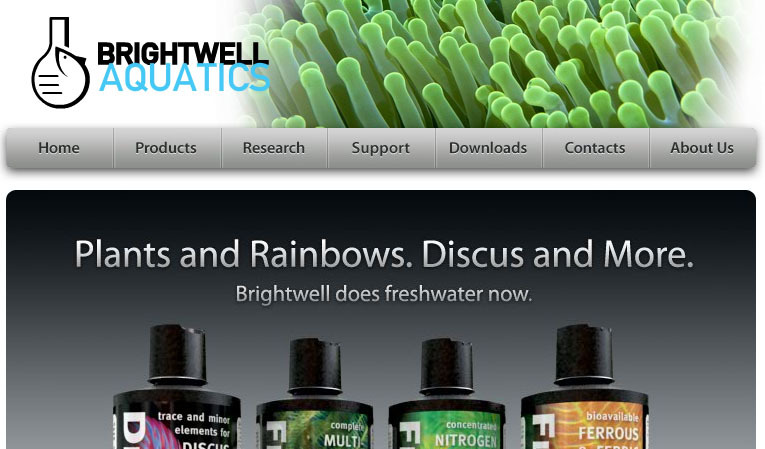 An exhaustive system of quality control ensures that each product with the Brightwell Aquatics name is exactly as it should be: produced to match our formulations. Every single Brightwell Aquatics water care product is lot numbered. Our employees take pride in manufacturing products to make the aquarium hobbyist’s water care routine more manageable. We are committed to a process of ongoing improvement to adjust the formulations of water care products as dictated by new discoveries in Chemical and Biological Oceanography. We are pleased to present our diverse line of products (most available in at least four sizes). Some of them compete directly against products that have been available for many years, however, hobbyists will find that these products are competitively priced and, in most cases, stronger and made with higher-purity ingredients and meticulous manufacturing practices. 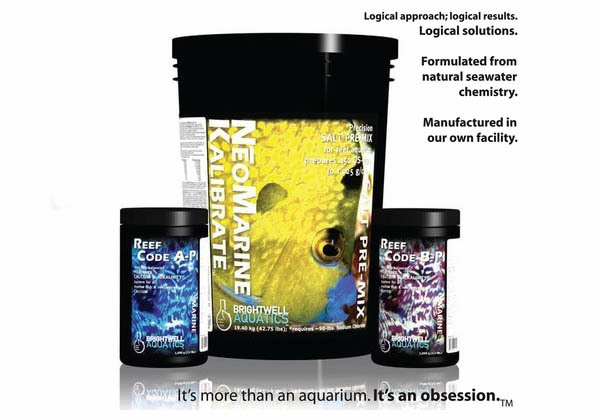 The vast majority of our products are innovative and feature unique and/or advanced formulations that address specific demands of aquatic organisms, in turn enabling the hobbyist to care for his or her aquaria much more successfully. We value your trust and loyalty, and greatly appreciate your business and do not take it for granted, particularly considering the number of choices hobbyists and retailers have when it comes to selecting aquarium care products. According to Brightwell Aquatics, “you supply the sodium chloride, we supply the rest.” The advantage of this approach, is that each hobbyist can determine the ratio of NeoMarine Kalibrate to NaCl they wish to use, and therefore control the levels of Calcium, Magnesium and Alkalinity. This allows the hobbyist to adjust these levels to better match the draw on their system. Naturally, hobbyists running a full fledged SPS system, will choose to use more NeoMarine Kalibrate than those who run a fish-only system. This salt premix will be available in 5 gallon pail and a drum, which are enough to product 450 and 6000 gallons at 1.025. For those tanks whose demand exceeds what is provided by waterchanges, Brightwell Aquatics also offers Reef Code A & B in powdered forms.